Most people who visit Zion National Park come in the warmer months, when Zion Canyon can be downright sizzling. But in winter, the white stuff does dust the higher elevations in the park from time to time. In January 2016, a rare snowstorm blanketed even the lower passages of the park, which sits on the edge of the Mojave Desert. We want to know how park rangers resisted the urge to put a few ornaments on this snowy pine. Zion National Park is a United States National Park located in southwestern Utah, near the city of Springdale. A prominent feature of the 229-square-mile park is Zion Canyon, which stretches 15 miles long and spans up to half a mile deep. It cuts through the reddish and tan-colored Navajo Sandstone by the North Fork of the Virgin River. The lowest point in the park is 3,666 ft at Coalpits Wash and the highest peak is 8,726 ft at Horse Ranch Mountain. Located at the junction of the Colorado Plateau, Great Basin, and Mojave Desert regions, the park has a unique geography and a variety of life zones that allow for unusual plant and animal diversity. Numerous plant species as well as 289 species of birds, 75 mammals, and 32 reptiles inhabit the park’s four life zones: desert, riparian, woodland, and coniferous forest. 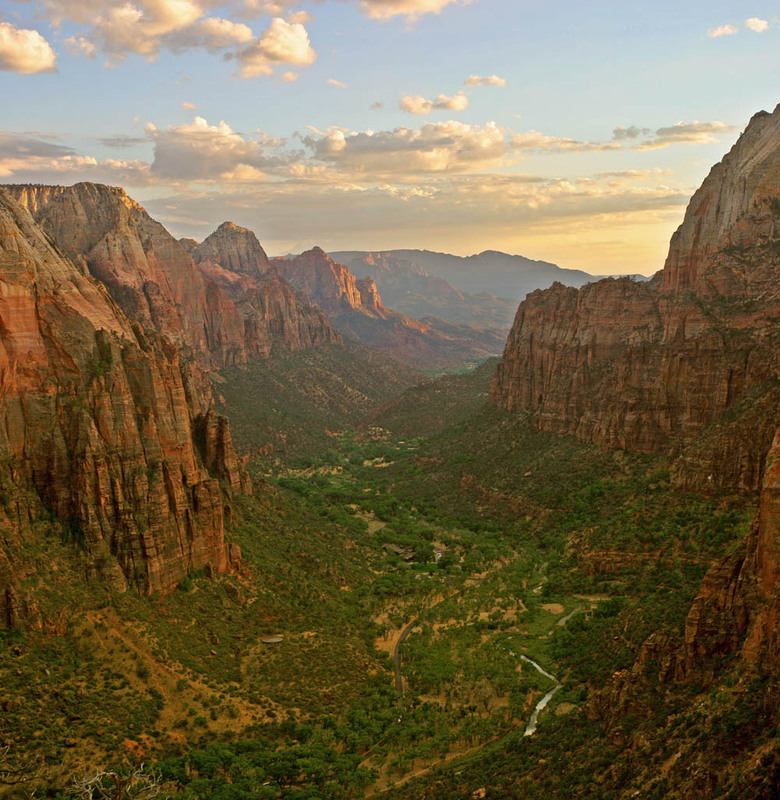 Zion National Park includes mountains, canyons, buttes, mesas, monoliths, rivers, slot canyons, and natural arches.